1. 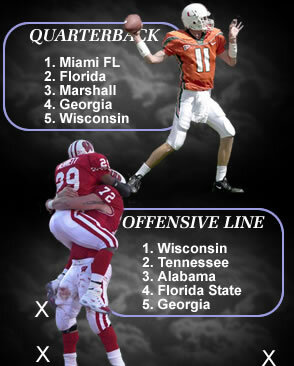 Miami FL - Since only one quarterback can play at a time, we would rather have Ken Dorsey be there than anyone else in the nation. He might not throw gaudy numbers like Rex Grossman or have the physical tools of a Byron Leftwich, but it is not hard to complain with a career 4:1 TD-INT ratio, a 26-1 life time record, a National Championship in his back pocket, and the ability to prove doubters wrong every time he is thrown into a big game. Also there when needed is athletically gifted Derrek Crudup, who is able to run the offense if the score ever gets out of hand, and freshman Marc Guillion, who looks to be the future in Coral Gables while competing with Brock Berlin as the next starting quarterback. 2. Florida - In just his sophomore year, he was not only able to put up video game like numbers, but also finish second on a Heisman list that many thought went to the wrong quarterback. Though many folks look at him as the best quarterback in the nation, having a new offensive system and coach could set him back. My guess is that he will be just fine with [Marshal's old offensive coordinator]'s offensive scheme. Ingle Martin and freshman Gaven Dickey bring athleticism, but have no experience. 3. Marshall - Byron Leftwich has all but assured himself a top 5 spot in the NFL draft come next April. But for now he will have to settle for destroying MAC secondaries with a fleet very capable wide receivers. Backing him up will be Stan Hill, who played sparingly last year. 4. Georgia - Having maybe the best combination of depth and quality in the country is Georgia, who comes in at number four. Leading the way is returning starter and SEC freshman of the year, David Greene, who is becoming one of the brightest young stars at his position in the entire country, throwing for almost 2,800 yards and 17 touchdowns in his first year of service, both freshman records. Backing him up is experienced senior Cory Phillips, who started and played well when taking over for an inept Quincy Carter. Also competing for serious playing time is redshirt freshman and highly regarded quarterback D.J. Shockley. His talent should allow him to find playing time in the crowded unit. 5. Wisconsin - Having two capable starters is a luxury most teams just do not have, but still, only one can be on the field at the same time. With the versatility of having Brooks Bollinger legs, 1301 career rushing yards; and Jim Sorgi's arm, 1096 and 9 touchdowns in eight appearances last year, Wisconsin will only be that much more potent and deep at the quarterback position. 1. Colorado - Maybe the only team in country that boasts three running backs that can go for 100 yards on any given day on almost any defense in the country. Returning for the 2002 season are juniors Chris Brown, the big rugged back, and equally as steady but shiftier and sleeker Bobby Purify. Returning along with them is the super talented but often injured Marcus Houston, who still needs to find his own in the offense and become the superstar he showed he could be in his freshman year before his injuries. We think this year he will finally do it. 2. Virginia Tech - Want to know what it feels like to have two #1 running backs, just ask Frank Beamer who now has to deal with getting both Kevin Jones and Lee Suggs enough carries for this upcoming year. After coming back from a brilliant 2000 campaign, Lee Suggs now is ready to continue where he left off, but probably won't be the main guy he once was as Kevin Jones proved himself to be very capable of carrying the load. Don't expect either one to have eye-popping numbers, but as a duo there might not be a better pair anywhere. 3. Alabama - Though Alabama might not have a gang of future All-Americans, they do have a very formidable group of good running backs that are very capable of running over stiff SEC defenses. Leading the way a year ago is returning starter Ahmaad Galloway, who was a steady runner with 5.1 yards per carry. Along with him could be the gem of the group, Santonio Beard. This game breaker averaged a very impressive 8.2 yards per carry last year and looks to be one of the nation's better young running backs. As long as he can keep his head straight and avoid the off field problems, he will soon be a household name. Joining them on the field this year is Texas Tech transfer Shaud Williams, who can be a threat on the ground or through the air, expect him to contribute right away. Adding even more depth are sophomores Marcus Dupree and Ray Hudson. 4. Nebraska - Both of Nebraska's 1-2 punch of Dahrran Diedrick and Thunder Collins both return with their combined effort of almost 2,000 yards between them for the upcoming year. Diedrick returns in hopes of again leading the conference in rushing and now he will carry a big burden on his shoulders with the loss of Eric Crouch. He will have a great shot at repeating the trick. Backing up Diedrick along with Thunder Collins will be DeAntae Grizby and Robin Miller who add a lot of experience in the offense as returning juniors. 5. Oregon - Not everyday does your #2 running back out rush your starter, but also gain over 1,000 yards in a season. Well that is what happened last year in Oregon with Onterrio Smith, who now has his eyes on being the main man in Oregon's backfield this year. Of course this All-American cannot do it all by himself. Helping him in a back up roll will be Allan Amundson and Ryan Shaw, who both have not had much experience, but could step up in case of need. Regardless, we expect this situation to be a lot like Boston College's situation with William Green last season after Cedric Washington went off to the NFL. 1. Texas - The super trio of Roy Williams, B.J. Johnson, and Sloan Thomas are together again for the third year now with Bo Scaife returning as one of the better tight ends in the country. Though their statistics might not be eye popping and Roy Williams might not have been the wide receiver we all thought he was going to be, as a group we know what these four are capable of. Quarterbacking and coaching aside, we still think this group is tops in the country. 2. Miami FL - With all but one receiver returning, Daryl Jones, Miami returns an abundance of talent including their top three receivers from last year. With All-American candidate Andre Johnson, co-starter Kevin Beard, and one of the better third options in the country in Ethnic Sands, this unit looks to be the deepest since the days of "flash and dash" in the late 80's and early 90's. Also look for Kellen Winslow Jr. to take over as Miami's next weapon at tight end, while spring standouts Roscoe Parrish and Jason Geathers look to contribute. 3. Georgia - Leading the way for Georgia is young star Fred Gibson and his 23.4 yards per carry average. Along side Fred is experienced, dangerous, but not always sure handed Terrance Edwards. Also returning is capable option number two, Damien Gary, who can be deadly after the run. Backing up those three will be a couple of big targets in Michael Johnson, the groups possession receiver, and former Duke stand out, Ben Watson, who looks to replace Randy McMichael at the tight end position. 4. 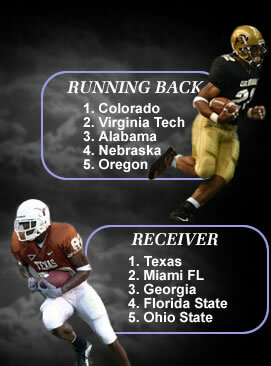 Florida State - What looked to be a slightly above average receiving unit in 2001 now looks to be one of the deepest and most athletic squads in the country. Returning from injury looks to be the leader of the group, Anquan Boldin and one of FSU's most experienced wide receivers, Robert Morgan. Throw in returning starter and now solidified star Talman Gardner, future stars P.K. Sam and Craphonso Thorpe, who both should improve after a very inconsistent freshman season, and you have a very deep set of good wide receivers. Though they should all improve and perform well as the season goes along, questions still could arise about how much of Boldin's and Morgan's play could maybe have diminished a bit due to their injuries. We are guessing they will be just fine. 5. Ohio State - Questionably with the best 1-2 combinations in the county. The big play ability of Chris Vance and Michael Jenkins returns to help the Buckeyes new quarterback become an instant success. Along side those two, hails future star Chris Gamble and a 5'9'' dynamo by the name of Bam Childress, which completes maybe Ohio State's best crop of wide receivers in the past five to seven years. Meanwhile, Ben Hartsock looks to solidify the tight end spot as Darnell Sanders has departed to the NFL. 1. Wisconsin - With All-Big Ten players like Al and Ben Johnson, it does not matter who is running behind Wisconsin's offensive line, it just simply becomes a matter of plug and play. Along with sophomores Dan Beunning and Jonathan Clinkscale at the guard spots is senior Jason Jovers at tackle; they are the main reason for Anthony Davis reaching 100 yards in all but one of his games last year, and why Davis should again gain at least 1400 yards next year. 2. Tennessee - Both Michael Munoz and Jason Respert come back from injury, which should only improve what is already a big and experienced front wall. Returning from last year's group are Scott Wells at center, along with seniors Will Ofenheusle and Anthony Herrera. Assuming all wounds are healed with coach Fulmer's offensive line, there is no reason to think this combination of talent, depth, and experience will not be one of the best in the nation. 3. Alabama - After starting off slowly in 2001, what was once a young offensive line now has the experience necessary to be one of the best. Coming back are freshman All-American tackle Wesley Britt and guard Justin Smiley along with fellow sophomore Evan Mathis. Leadership will come from All-SEC center Alonzo Ephraim and senior guard Marico Portis. 4. Florida State - Two All-American candidates, Brett Williams and Montrae Holland, lead this all senior group that should give young Chris Rix all the time he needs to find open receivers. Also coming back for their senior years are Antoine Mirambeau at center, Todd Williams at right tackle and Milford Brown at left guard. If this group can iron out some spotty run blocking then a 1,000 rusher should be in reach. 5. Georgia - With four of the five offensive lineman from last year returning and five seniors possibly starting for the Bulldogs, you can only assume that David Greene and Musa Smith will have an easy time putting up points on defenses running and throwing. Leading the way is All-American candidate John Stinchcomb and fellow three-year starter Kevin Breedlove, who along with Alex Jackson and George Foster, helped the offensive line surrender only 15 sacks all of last year. Look for Ian Knight to sure up the center spot as the only non-full time starter from a year ago. 1. Miami FL - This could be one of the best and deepest defensive lines college football has seen in over the past 15 to 20 years. With all 2001 starters returning and two additional starting defensive ends from the 2000 season, this front wall boasts six players with starting experience, four others with extensive playing time, and 39 sacks worth of production between all of them. Everything starts in the middle with All-American William Joseph and underrated tackle Matt Walters, whose interception versus Boston College last fall saved the day for the Hurricanes. On the outside, expect All-American Jerome McDougle and his equal in every aspect, Andrew Williams, to take care of the defensive end spots with former starters Cornelius Green, Jamaal Green, and situational pass rusher Jonathan Square backing them up. Providing depth in the middle is super blue chip sophomore Vince Wilfork, Santonio Thomas and redshirt freshman Orien Harris. 2. Oklahoma - Disruptive is the word that comes to mind when thinking of this Oklahoma defensive line. Anchoring the unit in the middle is last year's Freshman All-American defensive tackle Tommie Harris. Expect him to be mentioned as one of the top tackles in the country now that he has a year of experience under his belt. Along side him will be returning starter Kory Klein and Tennessee transfer Lynn McGruder, who looks to turn some heads in the Big 12 after sitting out his first year at Oklahoma. At defensive end, junior Jimmy Wilkerson returns as one of the most underrated players in all of college football at any position. Opposite him at the other defensive end spot will be Dan Cody with Jonathan Jackson rotating in frequently. 3. Michigan - Though Michigan might not have fared so well in the Citrus Bowl last winter, the defensive line did hold more than its own against a strong Tennessee offensive line. With the same four returning starters that held All-SEC running back Travis Stephens to 38 yards on 16 carries, Michigan easily has the most experienced and arguably most talented defensive line in the Big 10. In the middle returns Shawn Lazrus, who will be starting in his third year along with junior Norman Heur. At defensive end, First Team All-Big 10 Dan Rumishek and Second Team All-Big 10 defensive end Shantee Orr return to provide great pass rush from the edges. Providing depth for these four will be defensive end and freshman All-American Alain Kashama along with experienced backups Larry Stevens and Grant Bowman at defensive end and defensive tackle respectively. 4. Alabama - Few defensive lines have this much star power on their first team, and that is why Alabama ranks as the best defensive line in the SEC and one of the best in the country. Starting at the ends will be first time starter Nautyn McKay-Loescher and NFL bound, All-SEC defensive end, senior Kindal Moorehead. Together with the provided push from All-American Candidate Jarret Johnson as well as Kenny King, you have the returning trio that made up the heart of Alabama's defense. Though depth could be an issue down the road, they do have some talented backups that look to keep the future of this Crimson Tide unit bright. Sophomore defensive end Antwan Odom and junior Tackle Anthony Bryant, along with Todd Bates, will be counted on when substitutions are needed. 5. Kansas State - There might not be many big names in the Kansas State defensive line, but few ever get as much from their line as Coach Snyder does from his deep group. After giving up only 2.91 yards per carry and only 6 rushing touchdowns, this eight-man rotation of juniors and seniors return with a ton of experience and more depth than Coach Snyder may know what to do with. Battling it out for the defensive end spots will be returning starter Henry Bryant, Melvin Williams, Andrew Shull, and Thomas Houchin. All should be easily interchangeable and frequently used to help with the outside pressure. The interior returns Big 12 defensive newcomer of the year, Tank Reese, while Justin Montgomery and Corey White battle it out for the other tackle spot. 1. Miami FL - Well what do you expect from the same school who brought us such names as Darren Smith, Jesse Armsted, Michael Barrow, Ray Lewis, Nate Webster and Dan Morgan? This time it is outside linebacker DJ Williams who is the athletically gifted. Hard hitting middle linebacker Jonathan Vilma showed us his linebacking IQ as a true freshman when he was thrown into the fire versus FSU and Syracuse. Also returning and competing for the other outside linebacker position is former starter from the 2000 Hurricane squad Howard Clark, who is currently struggling to hold his job over future star and redshirt freshman Roger McIntosh. 2. Georgia Tech = Returning all three starters, Georgia Tech's 2002 trio looks to be not only improved, but the reason why the Yellow Jacket defense could be the best in the ACC. Junior Daryl Smith, who led the team in tackles as a freshman returns as the team's most feared hitter, while on each side of him is Keyaron Fox and Recardo Wimbush, who each recorded 95 and 96 tackles respectively. If that wasn't enough, Ather Brown, who was Georgia Tech's starter for all of the 2000 season, returns from injury to give us the nation's most experienced group of linebackers. 3. Auburn - Led by the play of weak side linebacker Dontarrious Thomas and his 122 tackles (double the amount of any other Tiger), along with Karlos Dansby on the outside while Mark Brown fills in the middle slot, the Tigers are primed for a great defensive run in 2002. Providing depth will be Mayo Sowell, Jake Slaughter, and future star in the making Lemarcus Rowell, who is also capable of filling in at the middle linebacker spot. 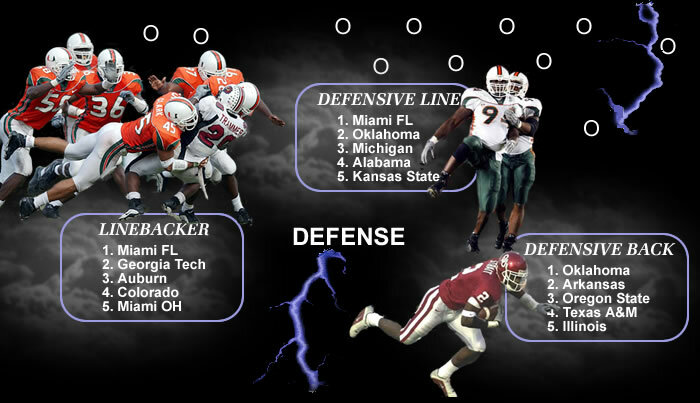 With this much depth, do not be surprised to see a lot of 3-4 defensive fronts to utilize all of the talent. 4. Colorado - One thing this group is not short on is experience. With four players out of the two-deep roster being seniors, this herd of Buffalo could make for one of the best linebacking units around. Seniors Drew Wahlroos and Joey Johnson, who filled in for the injured Sykes last year, return along side Sean Tufts, who is the heart of the unit. Backing up these big play linebackers will be seniors Aaron Killion and Kory Mossoni, who only add experience while freshman Andrew Ward breaks into the depth chart. 5. Miami OH - Can you name which linebacking unit in the country is the only one to boast two Lombardi award watch list players? Well we can and its Miami of Ohio. Leading the way is one of the strongest pair of linebackers you will see on the same team with senior outside linebacker Matt Robillard and junior middle linebacker Terrell Jones; both first team All-MAC performers. Helping them out will be experienced junior Nathan Clayton and senior Matt Edwards, who are both coming back from injury plagued careers. Also look for freshman Jarrod Rich and Shawn Ashcraft to provide depth while they develop as the future of Redhawk's linebacking unit. 1. Oklahoma - Only in Oklahoma can you lose an All American safety like Roy Williams and still have the #1 secondary in the country. The main reasons why this secondary won't miss a beat will be due to the best Cornerback Duo in the country with Senior Andre Woolfolk and junior Derrick Strait. Giving them great depth is often active Antonio Perkins, who finds his way on the field in nickel and dime situations. At safety, trying to fill the void for Roy Williams will be Eric Bassey while Everage will creep up and play that fourth linebacker position from the safety spot. This defensive backfield will make the Oklahoma defensive line only look that much better than what it already is. 2. Arkansas - With only Oklahoma maybe having more depth and talent, Arkansas in its own right boasts a great pair of young cornerbacks with Lawrence Richardson cemented in at one corner spot while Eddie Jackson and Ahmad Carroll battle it out for the other cornerback spot. Though Hamlin will be suspended for the first few games of the year, this All-SEC safety will come back in time for some key SEC divisional games. Filling in at the strong safety spot will be junior Jimmy Beasley. Perhaps the most impressive part of this secondary is that every single starter, including the nickel back, will all be eligible for the 2003 year. 3. Oregon State - After starting the year with a 1-3 record, Oregon State's secondary yielded no more than 208 yards passing in a single game. In five of their final seven games, the Beavers held opponents well under 200 yards in the passing department. Hoping to continue their mean streak out in the Pac Ten will be returning All-Conference Cornerback Dennis Weathersby and his opposite Terrell Roberts. Returning at free safety will be Mitch Meeuwsen, a promising sophomore who played well as a freshman the year before. The new face in the secondary will be Lawrence Turner, a junior who beat out Shamon Jamerson for the vacant strong safety spot. With capable depth, this should be the Pac Ten's strongest secondary and one of the best in the country. 4. Texas A&M - Sammy Davis Jr., a.k.a. "The Candy Man", returns as one of the top corners and leads this rugged Texas A&M secondary as one of the best in the country. Along side Sammy Davis are two capable corner backs, regular season starting Sean Weston and Galleryfuniture.com Bowl standout sophomore Byron Jones, who is coming off of a three interception output in an MVP performance. Look for him to perhaps upend Weston for the starting job. At safety, Texas A&M returns tackling machine Terrence Kiel at strong safety, while the free safety spot looks to be filled by junior Dawon Gentry. 5. Illinois - All American candidate Eugene Wilson and his opposite, All-Big Ten 2nd team cornerback Christian Morton, together make up one of the best corner duos in the country. After achieving 45 total pass break ups, these two will need to pick up the extra slack left behind by the departure of two starting safeties. Replacing the safeties will be Jamaal Clark and Taman Jordan with Marc Jackson also joining in to help out. Experienced cornerback Michael Hall also returns for his senior season to add even more depth to what is already a deep and experienced group of defensive backs.